The Kyocera contains a faster core processor (The venerable 33MHz Dragonball) and the full-sized 2 MB flash ROM space. Many complained with the pQ that it wasn't capable of handling PalmOS upgrades. Though you generally won't do many phone upgrades on the QCP-6035, it's within the generally accepted outline of standard Palm characteristics. It also features 4 MB of user RAM for installing extra apps and your ever-burgeoning database of phone contacts...because let's face it - If you're getting a cellPDA, then you're probably wanting the ease of one-click phone dialing and other similar address book features. Outside of the written specs listed on the last page, the phone has several other features worth noting. The first and foremost, of course, is the phone flip. This (mostly) protective cover shields the screen from your face while you use the phone in its closed mode. It also provides the dialing surface, and four macro functions related to the phone. Incidentally, these buttons are located directly over the four standard Palm buttons, so basically the functions of those buttons get remapped whenever the flip opens and closes. One of the more useful functions is the speakerphone button. Hit the button and you can now talk to your friends and associates at will. While speakerphone is on, you can also open the flip so that you can use your Palm software while still talking to the other party. Opening the flip during a call will automatically turn on the speakerphone, so that's nice too. Alternatively, the phone has a 2.5mm headphone jack that works with most of the standard cellphone headsets on the market. Another one of the base buttons is the voice-mail button - Hitting this button will automatically log you into the voicemail system on your phone and let you check your messages, provided your phone vendor has it set up properly for you - Ours didn't. Since the phone always maintains a connection to your cellular network, it will also periodically check for new text and voice messages. The phone will automatically download text messages for you, and notify you of new voice messages. The phone has a shuttle-dial on the left-hand side, so it's useable whether the flip is opened or closed. Opened, and it operates just as on any other Palm - Scrolling the screen, and selecting items. When the flip is closed, the phone software takes over, and the shuttle acts as your primary control mechanism while navigating menus and selecting phone options. The screen is approximately the same size as on the Palm m100-series. It could've been a bit larger, but not at the cost of sacrificing the size of the phone. I hear some people complaining about how they feel their regular commonplace cellphones are too big and bulky...I have to wonder what they'd say if they saw the QCP-6035. While it is certainly larger, I feel that its size actually makes it more manageable - It doesn't feel as flimsy. The infrared port on the top of the phone is particularly interesting. Its functional not only as the standard Palm iR port, but it also acts as the phone's backlight button. The Kyocera uses reverse-lit backlighting for better visibility in low-light situations. This button can also act as the suspend button for the phone, though I found its operation to be a bit less than 100% reliable. It would always operate the backlight, but whether or not it would wake the phone from sleep mode properly was another matter entirely. The phone has built-in power-on protection to avoid battery waste. Basically, if you push the button once, the phone prompts you to push it again, or press 1-2-3 to exit the keyguard. Using 1-2-3 always worked, but the phone wouldn't always respond to the backlight button press. In reading comments of other users on various websites, it seems this isn't an isolated problem. It doesn't heavily detract from the operation of the phone, though, so it's easily overlooked. I'll also take a second to mention the special cradle that Kyocera makes for this phone. Since the flip-cover opens downward instead of upward, the cradle was designed so that the phone could be used or configured while sitting in the cradle. Also, a space in the back of the cradle allows you to charge a second cellular battery, for the professional on the go. One caveat - The cradle will only charge one battery at a time - Once one is full, it will begin charging the other, and it's first-come first-serve. The standard battery for the Kyocera is a lithium ion battery, with general usage (including Palm functionality) time of around a week, and six hours talk-time. Like any other cellular phone, you can turn the transceiver off to save battery power if you don't need to accept any incoming calls, or if you run out of cellphone minutes. Another chief complaint of the pQ was its illogical software integration. Essentially, the pQ was a phone and a PDA stuck in the same box, neither knowing of the other's existence. The Kyocera takes this leaps and bounds further by fully integrating phone features into the OS. For instance, let's say that I want to call my friend Matt. I can do this a number of ways. I can manually dial his phone number on the keypad...I can use the shuttle-dial to index the address book and dial his number, either by looking it up in my listings, or by calling him back from my call log...I can also open the flip on the Kyocera, and use the address book program to look him up, then click on his phone number. Finally, I can also use voice dialing. Since the Kyocera has that built-in speakerphone, you can either leave the flip open and talk on vox, or you can close the flip at this point and talk like normal. The *big* feature of the Kyocera's integration is the interconnections between the phone book databases and your call records. As I mentioned before, the Kyocera has a built-in Call Log that lets you reference all the incoming, outgoing, and data calls you've made from the phone. You can callback numbers directly from this list, or you can select an entry and plug it into a new Address Book entry for "record completion". Once you've assigned a name to this phone number, the records in the Call Log all reflect the new name, and anytime you receive an incoming call or make an outgoing call, you'll see that person's name on the phone. This is useful for identifying incoming callers (As well as their location, based on phone listings for work, home, mobile, etc. ), as well as confirming phone numbers you've manually typed for outgoing calls. Furthermore, the Call Log integrates with the Expenses application. While I don't use Expenses, it is pretty nifty to be able to log your phone calls in the Expenses table so that you can log how much airtime your boss used calling you at home, and send him a bill. You could also use it to easily size up your phone usage statistics, in case you decided on a change of usage plan. The phone-dialing integration is really neat. Basically, any time you click on a phone number in the Call Log or in the Address Book, you'll automatically dial that number. This also works when you use the record search function. The screen will put an onscreen phone keypad and information on the screen at this point, though the call will remain connected if you exit the application at this point. I only had one small problem with this - I frequently accidentally started the dialer as I was attempting to select records in the Address Book. Since the phone is essentially a Palm with a speaker and microphone, it's a relatively trivial matter for the phone to also operate as a voice pad, letting you take audio notes and play them later. Also, with the SDK kit from the Kyocera website, you can also create your own ringtones from any 8-bit 11kHz .wav file - Just run the conversion tool on the file, and then sync it to your phone. Like many cellphone models, you can pick specific ringtones for particular address book categories. Given the popularity of this feature, it'd have been nice if Kyocera made a better application around this for anyone to use, rather than requiring users to discover it for themselves. Also, more customization of ringtone associativity would have been nice - For instance, different ringtones for work or mobile phone numbers, or different ringtones for individual users. You can easily assign individual users to their own Address Book category, but this defeats the point of the categories option in the Address Book. 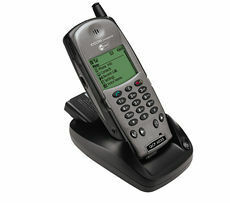 The QCP-6035 is a digital phone and primarily designed for PCS-based services. 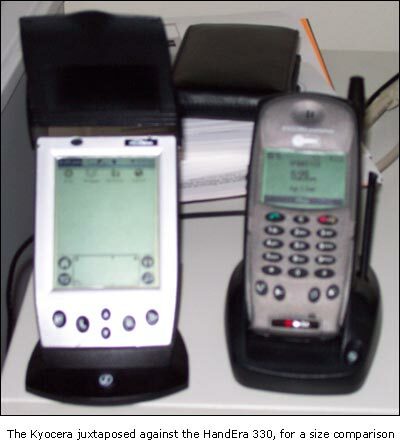 As a matter of fact, only two major carriers offer phone service with the QCP-6035 - Sprint PCS, and Verizon. That isn't to say that you have to be a customer of one or the other, of course. The 6035 is a tri-band phone, so it will operate in PCS and analog networks perfectly fine, supporting 900MHz, 1.8 GHz, and 1.9GHz transmission frequencies. Unfortunately, no GSM in this model...Kyocera doesn't even market this phone overseas. You should check with your carrier before committing to purchasing this phone, however, to make sure that they won't force you through any special charges or caveats for using a phone they don't provide. Programming the phone to change networks is relatively easy to do, once you have the appropriate documentation. When using the phone on a supported network, the Kyocera also offers data-transmission capabilities. The phone includes software from Eudora that allows you to do Palm-based internet browsing as well as wireless e-mail functionality. I've tested them both to surprisingly good results. The Eudora software is reasonably functional, as is the desktop conduit software Eudora offers for syncing with Outlook, Netscape Messenger, and any number of other e-mail programs out there. But let's face it - If you're checking e-mail or browsing the Internet from your cellphone, you're probably not interested in the idea of playing Flash games or viewing images on the small grayscale screen. Since your cellphone company is also your ISP and generally knows what hardware you're running your connection over, they clip out the graphics and other useless clutter remotely, saving the amount of data transfer time you'll have to pay for on your phone. Nice. Lastly, using either a cradle or a serial cable, the phone will operate as a wireless serial modem for a laptop or handheld computer. While not useful to me personally, it does permit a phone owner to get his fix of...ahem...graphic images, while still out in the middle of nowhere. Essentially, it's a useful way to overcome the browsing limitations of the small screen. This phone is definitely loaded with a lot of nice features. But there's definitely one huge drawback that will put most people off - The price. Even when subsidized by Verizon or Sprint, the phone still costs $199 retail ($299 without the subsidy). This is quite a price drop from its original pricing of $499 with contract, $599 retail, but still tough to compare against phones that are $30, $20, or even free. This is one of the same disadvantages that has prevented the widespread adoption of similar devices to the Kyocera QCP-6035, and will likely continue to do so in the future. Samsung recently introduced a Palm-based phone with a color screen and no flip-cover - It costs even more. Handspring is making a similar move with its Treo line of organizers - Time will tell how well consumers will adopt these new models. Another key disadvantage to the Kyocera is its use of a proprietary cradle interface. This prevents use of many aftermarket accessories, which use the Universal Palm Connector (Which isn't so universal anymore, thanks to Palm). Naturally, Kyocera offers similar devices (Spare/portable cradles, a portable keyboard) on its website at reasonable prices, but to me it seems to be an unnecessary design decision, and another flaw that hinders its adoption. Like many other cellphones, the QCP-6035 is only intended for use in the USA. It's a shame that this phone doesn't support GSM transmission modes, because I'm sure a phone with this level of functionality would be more than welcome in Europe and Asia, where the cellphone market is arguably larger. Finally, there's the issue of the screen. This is actually a problem that all cellPDA manufacturers face, and with the exception of the Treo, Kyocera has done the best job of fixing this problem. The traditional phone design puts the screen of the phone immediately underneath the receiver, so that most of the controls and information is immediately present. The problem comes in when you're using the phone - Your cheek and fingers are highly likely to rub against the screen, coating it in icky grease. Most phones up to this point haven't covered up the screen, but the flip on the Kyocera covers up about two thirds of it. The top third still gets some skin contact, but not nearly as much. Still, it would have been nice of Kyocera to include some screen covers with the phone, since they're practically a requirement here. Or, better yet, a retractible transparent screen cover inside the flip - You could pull it out when you don't need to flip the phone open, guarding the rest of the screen. This phone (Is it a phone? Or is it a PDA?) is truly a unique and helpful innovation. Its design depicts thoughtfulness to nearly all ends. The screen cover suggestion I made is most likely an oversight on the part of Kyocera - One must give them credit for at least partially solving the problem, though Handspring's Treo line looks to have a completely covered screen using a flip-down lid similar to the Motorola StarTAC phones. The concept is a no-brainer - The functionality and customization of a Palm, integrated with the features of a cellular phone. You'd say it was a wonder nobody else has done it already, but they have, and there's one big looming reason why few companies actually *do* build these - The price. The Kyocera's single most awful feature is its expense, placing it out of practical reach of most techies and private individuals, and making it less attractive to many business purchasers. Still, when you combine the pricing of a Palm i705 and a typical cellular phone, this actually is a bargain.